Create, Delete and Apply Deposits right from the student page. Search for your student and click on the family name/number. This will bring you to the Family Billing. Payment Adjustments, are not considered reportable income. Use this payment type if you are crediting volunteer hours, have fundraising or some other adjustment that is not truly income. Click on the Creat deposit tab. If a deposit has been applied to an invoice, the deposit cannot be deleted without first deleting the payment off the invoice. Once the payment delete is complete, the deposit is then able to be deleted. Select the invoice you are paying. 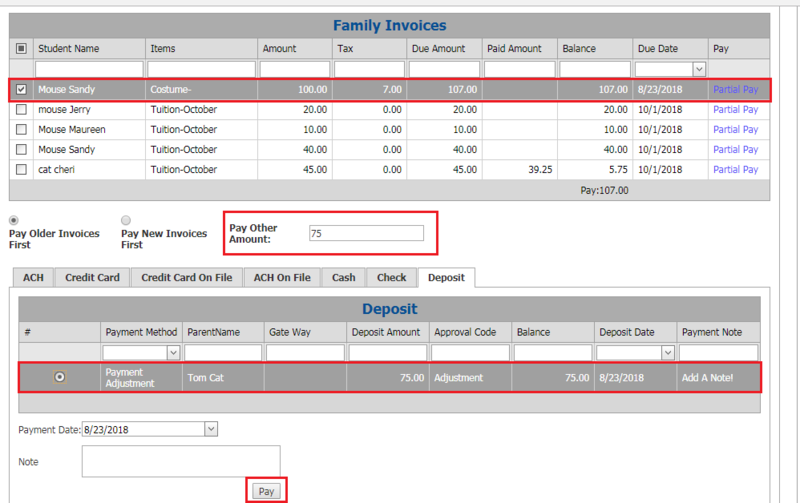 If the amount of the deposit is less than the amount on the invoice enter the deposit amount in the “Pay Other Amount” box. Choose the Deposit tab at the bottom and select the deposit you want to use. Enter the date and click pay.